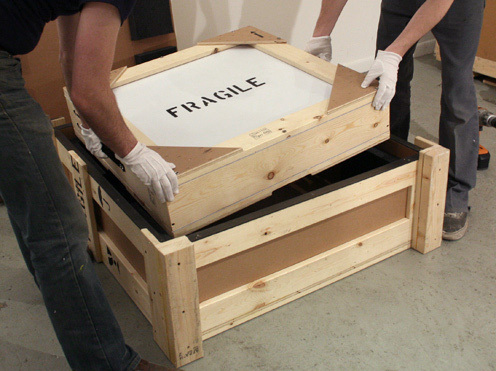 As collecting art has become a much more affordable and common practice–it’s not just for the 1% anymore–we’ve been seeing more clients who have questions about how to handle packing and moving a large painting, print, sculpture, or even some intricate multimedia pieces. And when it comes to tips on how to move art from one place to another, consulting moving experts with experience in moving art is literally step numbero uno. But who do you know to call and what about using a different service for the art? Below we relay our experience with moving art and how you can make the process as painless and simple as possible. Like we said, if you’ve given us a call or are reading this, then you’re already on the right path. Moving art is not easy; that’s why there are professional art handlers that do the work of moving work from one location to another. Of course, even if you’re trying to turn your home into an art gallery, chances are you might not be able to afford the cost of hiring an entirely different set of movers, especially if you only have a few items to move. Ask around and do your research into professional moving services in Chicago that employ movers with art-handling experience or provide art-handling training to their employees. Chances are you don’t need the creme de la creme, but you also don’t want to skimp on a professional moving service that can help you with moving art as it only takes one mistake to seriously hurt your favorite painting or sculpture. Now just because you can possibly save on the cost of moving art without risking the quality of service, that’s absolutely no reason to skimp on packing materials. And if you think a piece of art could use a bit more bubble wrap, go for it. If that means you need a larger box to contain the work, then get it. Oh, and have glassine on hand to place over the glass of the frame so that nothing gets scratched. Are you starting to notice a pattern here? Art does not just tend to have a high price tag; for many it has priceless sentimental value. For instance, if you had a parent who was an artist, chances are that you’ve inherited a few pieces, likely ones that have some personal significance that likely trumps the financial value, or at least matches it. So when it comes to packing your art, make sure you don’t skimp on anything that can help protect the artwork if it is dropped or somehow falls during the drive. And make sure everyone involved in packing and handling the art is wearing clean gloves to avoid getting finger smudges anywhere. If you’re packing a framed painting, the last thing you want to do is scratch the glass. Using cheap packing materials like newspaper or parchment paper, while good for somethings, is a big no-no when moving art. Additionally, when it comes to applying “dunnage” or packaging within the box to keep the art from moving around, packing peanuts have a tendency to get squished and bunch up, thus providing your precious art with less padding and allowing it to move around more. In addition, while most packing peanuts are now biodegradable and made from peanuts or corn, if your box encounters any moisture such as rain drops or condensation from the heat, then those peanuts are going to turn to goo and get all over your art. Bubble wrap is truly your friend when it comes to moving art. One way to make sure you’re packing your art the right way is to hire a professional packing service so experienced Chicago movers can take your mind off the art and focus on the logistics and other important matters. In the end, moving art is a professional job that thousands of trained individuals do in major cities every days. If you’ve already invested in buying a piece of art, why risk it by not investing in getting professional Chicago movers and the right type of packaging? Having peace of mind is worth way more than saving a few bucks and being anxious the whole time that you didn’t get the right materials or movers.